There are few places where the coast and the mountains are close enough to surf and ski in the same day. It’s a bucket list adventure, one that Trucks.com thought would make an epic journey as we tested the three top-selling compact crossovers. Coastal Orange County, Calif., and the nearby San Bernardino Mountains provided an ideal setting. The 120-mile road trip started at sunrise in Huntington Beach and ended in the afternoon at Big Bear Mountain Resort. 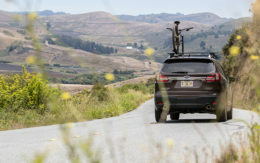 The route gave us ample opportunity to test how the 2019 Toyota RAV4 Adventure, 2019 Nissan Rogue SL and 2019 Honda CR-V Touring – all with all-wheel-drive – handled the diverse driving and gear-hauling conditions. Compact crossovers offer the versatility to match a trek of such large proportions. They have excellent fuel economy. Even the lowest-rated crossover gets over 20 miles per gallon. They provide adequate storage space without the bulk of a giant SUV or pickup. The interiors offer comfortable, upright seating positions with plenty of head and elbow room. Most come with larger wheels and are capable of traversing light off-road trails. They don’t break the bank. The average transaction price for a midgrade compact SUV was $26,790 in 2018, according to JD Power. Huntington Beach, known as Surf City USA, was a natural starting point for our adventure. It’s home to the iconic Huntington Beach Pier – which spans 1,850 feet and is one of the longest public piers on the West Coast – and 9.5 miles of beaches with yearlong consistent surf. The World Surf League also stages heats for the U.S. Open along the pier in the summer. In February, waves are small and water temperatures hover around 55 degrees, but surfers are always in the water on both sides of the pier. Big Bear Mountain Resort’s Bear Mountain served as our finish line because of its proximity to the coast and popularity among locals, who stream there at any sign of snowfall. Bear Mountain is known for its irregular terrain built for freestyle snowboarding and skiing. It has halfpipes, jumps and jibs off every chair as well as a 580-foot long, 77-foot wide superpipe with 18-foot walls. And its 8,805-foot peak is the highest in Southern California accessible by a lift. Our team paired with three multitasking athletes to evaluate the crossovers. We looked to see how they would tackle different terrains and weather conditions as well as how comfortably we could pack double the amount of gear they usually haul. That’s why a successful trip from sea level to 7,100 feet requires more than a capable vehicle. Cold water, full-body wetsuits are bulky, and surfboards require safe handling. Winter mountain attire is voluminous, and the accompanying boots, skis and snowboards are large, oddly shaped and unbendable. Flexible cargo space is a priority, and roof rack systems are a must. For information on racks and installation, we consulted experts at Costa Mesa, Calif.-based Rack N Road, which outfitted each vehicle with its own system specific to our adventuring needs. We assembled at the Kimpton Shorebreak Hotel, a chic coastal lodge across Pacific Coast Highway from the pier. First light appeared just before 6 a.m. The surf was 2 to 3 feet. The early morning temperature was frigid, around 50 degrees Fahrenheit. The waves were small, but fun, said Caley Vanular, a snowboarder from Vancouver, Canada, noting that the water was a touch warmer than expected. Mike Soulopulos, an avid surfer from Laguna Beach, Calif., and Willie Woodward, a Salt Lake City-based skier, shared the early morning surf session. Our route to the snow spanned a mix of highway and mountain driving that would take an estimated 2 hours and 30 minutes. Southern California’s winter has seen more snow than typical this year, and several of the main roads have undergone closures, including the more direct CA-18. We decided to take the more roundabout back way through CA-38. Packing all the gear was a concern but turned out to be easier than expected. We needed to leave drivers with clear sight lines, especially out the rear window. And front seat passengers deserved comfortable space, uncrowded by gear. Still, each vehicle was its own puzzle. 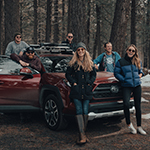 The 2019 Toyota RAV4 Adventure had a Thule Snowpack Extender. The 2019 Nissan Rogue had an Inno surf locker. Toyota’s new RAV4 has 37 cubic feet of cargo space behind the rear seats, the least of the group. The Honda CR-V offers 39.2 cubic feet with the rear seats up, slightly less than the Rogue’s 39.3 cubic feet. Inside each vehicle we used the larger side of the 60/40 split in the rear seat to load cargo. The RAV4 had a Thule Snowpack Extender affixed to Aeroblade Crossbars. We used the brand’s Rapid Crossroad Foot pack to attach it the crossover’s raised roof rails. It was loaded with two pairs of skis (the rack holds up to six pairs or four snowboards). 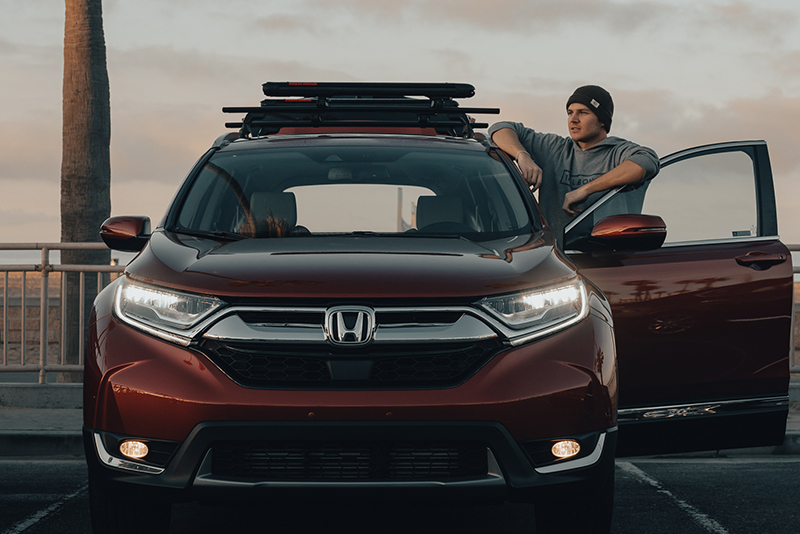 The CR-V sported a Yakima FatCat 6 EVO ski and snowboard rack mounted on Jetstream crossbars, which were attached to flush roof rails with SkyLine towers. Although it can haul up to four snowboards or six pairs of skis, just two snowboards made the trip. A system from Inno Racks – the IN-AR Base Stay Set and Square Base Bars and the INA445 surf locker – was installed on the Nissan Rogue. This specific rack, which hauled two surfboards over 100 miles, was recommended as proficient for extended highway driving. Local shaper Infinity Surf of Dana Point provided 6-foot-2-inch and 9-foot-6-inch surfboards for the adventure. The Rogue carried one set of skis inside, and the CR-V hauled a third, 5-foot-6-inch Infinity surfboard. Once packed and settled, our caravan pulled away and started south on scenic PCH. Baby waves still lapped against the shore as the sun edged its way higher into the sky. The first 68 miles of the drive were mostly four-lane freeways and surface streets. Merging onto the 55 Freeway in nearby Costa Mesa, we headed north toward CA-91. The extended freeway driving gave us a chance to test the vehicles’ driver-assist technology. All three crossovers are equipped with a suite of advanced safety technology that comes standard on the premium trims. The features are important for mitigating driver fatigue while navigating traffic on a daily commute or road trip. Most notable is the adaptive cruise control, which uses radar to follow the speed of the vehicle ahead. Lane-departure assist helps the driver stay within the lines of the road. This technology performs best on a long stretch of road with clearly marked lane lines. Blind-spot monitors use lights on the side mirrors to alert drivers to vehicles they might not see. 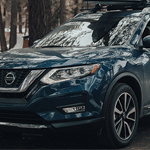 While all crossovers had backup cameras, the Nissan Rogue was the only vehicle that provided a 360-degree view around the car for managing tight quarters while parking. We finally merged onto CA-91 for the second city section of the drive. Riverside is often congested but offers plenty of spots for food and fuel. We stopped at In-N-Out, a well-known burger joint found mostly in California. Then it was back on the road. Before our climb into the snow-capped San Bernardino Mountains, we still had three freeways to traverse. The complex directions gave us a chance to test the crossovers’ navigation systems. The Rogue and the CR-V feature 7-inch displays with infotainment systems that include navigation. The Rogue’s intuitive menu, which combines the use of the touch screen and traditional buttons for different menu selections, was easily navigable. The CR-V system offers streamlined touch screen options and a hard knob for volume control within reach of the driver. Toyota’s RAV4 navigation system was the hardest to operate, although its touch screen display is 1 inch larger. The navigation function shares the display with other information, and it was unclear how to undo the split layout. The gauge cluster behind the wheel – a 7-inch “multi-information” display with a digital speedometer – was cluttered and confusing. However, all three crossovers were Apple CarPlay- and Android Auto-compatible. Drivers could plug their phones in and access their favorite map systems. Overall, they were more comfortable using the phone navigation apps to make the many freeway changes. Eventually, we weaved through Redlands to find CA-38, the road into the San Bernardino National Forest. This marked the first change in scenery, transitioning from concrete city to woodsy suburb. The mountain drive, a winding, two-way road, approaches Big Bear Lake from the south. Traveling the remaining 50 miles takes about an hour and 15 minutes. Each crossover had just enough guts to climb the mountain confidently with the added weight of the gear, but none delivered a thrilling drive experience. The RAV4 had the most power yet felt the slowest off the line. The Adventure trim features a 2.5-liter four-cylinder engine that delivers 203 horsepower and 184 pound-feet of torque mated to an eight-speed transmission. The Rogue SL, the weakest of the group, has a 2.5-liter four-cylinder engine with 170 horsepower and 175 pound-feet of torque. It also has a sluggish continuously variable transmission. Honda’s CR-V Touring sports a 1.5-liter turbocharged engine paired to a continuously variable transmission. The engine makes up to 190 horsepower and 179 pound-feet of torque. It wasn’t as fast as expected, but it performed better than the RAV4. Despite minimum power and a lack of excitement, all three crossovers handled the narrow, twisty mountain roads adequately. The RAV4 and the CR-V were equipped with all-season tires, making them especially prepared for bumpy terrain. Once we reached the mountain town of Sugarloaf, we turned left onto Big Bear Boulevard and continued for six miles. Though the sun hung high overhead, the thin mountain air was cold and crispy. Pine trees lined the streets, and snow patches peppered the road. The caravan, now driving more cautiously, made its way to Bear Mountain, one of two ski destinations in the area that make up Big Bear Mountain Resort, which is owned and operated by Denver-based Alterra Mountain Co. The other is Snow Summit. The roads had been cleared recently, offering limited opportunity to test the crossovers’ maneuverability in heavy snow conditions. However, we did get the crossovers onto the snow at the west side of Bear Mountain’s base. This was the shining moment for the RAV4 Adventure. Its multiterrain drive modes, which include Mud & Sand, Rock & Dirt, and Snow, are meant for more rugged adventuring. Coupled with its grippy tires, Snow mode eased the crossover up and over a snow bank, right at the bottom of Inspiration run, near Chair 7. The Rogue and CR-V also tapped the AWD systems for a boost onto the packed snow. The Rogue has AWD lock, a button to the left side of the wheel that prevents the system from defaulting to two-wheel-drive. The CR-V muscled itself onto the snow using a low gear, an option located on the shifter. The CR-V was the only crossover to have a tow hitch in addition to two recovery hooks on the front bumper, helpful additions had the snow been deep enough to require digging out. After the long drive, anticipation for the slopes was palpable as the group started pulling skis and snowboards off the vehicles. The Thule Snowpack Extender’s sliding feature let skiers pull the rig toward the edge of the roof for smooth unloading. The Yakima FatCat 6 EVO was simple to unlatch even though it retained a tight clamp on the snowboards throughout the drive. There is one notable disadvantage to mounting large equipment on smaller vehicles. The surfboards on the Rogue rendered its rear hatch unusable. Instead, drivers accessed luggage and other equipment stored in the rear by folding down the second row of seats. Having traded wetsuits for parkas, the group dashed toward chair 9 to ride to the top of 8,440-foot Goldmine Mountain. Snow was chunky and icy in parts, but it was a fun ride down, especially under the bright California sun. Both surfing and skiing are highly dependent on weather and require lots of gear. Having the right vehicle can make or break a trip, especially when traveling at altitude. Racks also are essential. Picking the right system that can protect your equipment, withstand weather and endure highway driving is key. Though there were pros and cons to each crossover, the three proved to have legitimate adventure spirit. The team relished the victory of conquering surf and snow in one day – a first for all – and proved that a good crossover is as much a part of adventure gear as a well-crafted surf or snowboard.